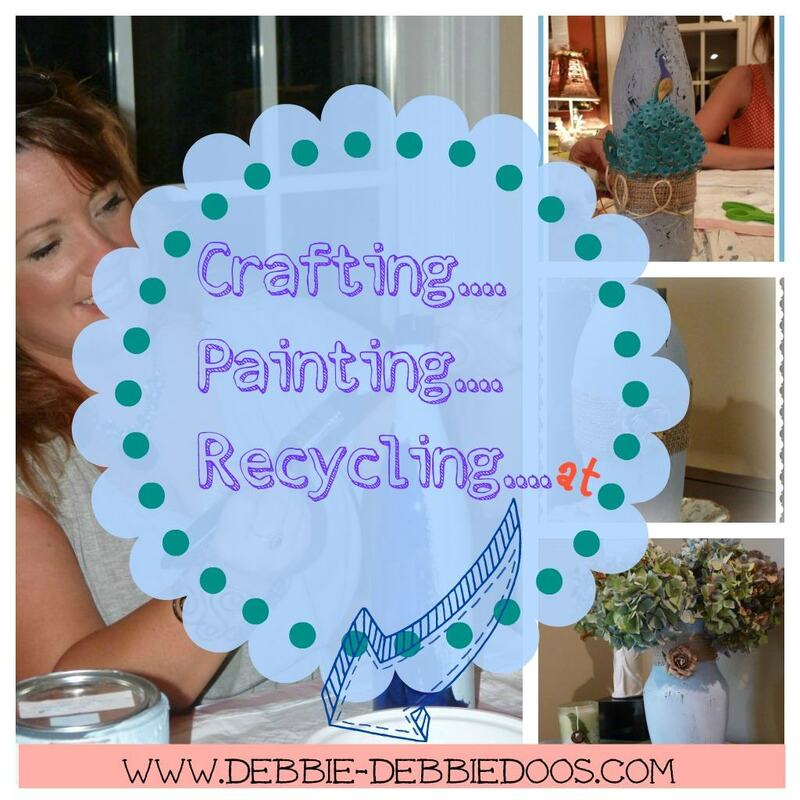 Crafting, recycling, painting on glass project. 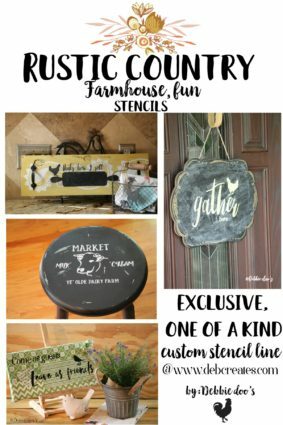 diy projects, including, upcycling, recycling, painting, stenciling, mod podge and more! I also shared recently my craft wine bottles with friends night. Don’t you just LOVE my dried Hydrangeas?! 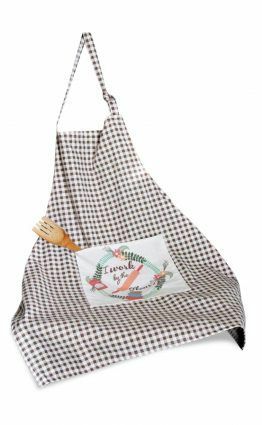 Thank you Lorraine from Miss Flibbertigibbet! Basically this entire little arrangement was FREE. The vase was from the Dollar tree, I purchased some time ago. The flowers as I just mentioned were sent to me as well. The cute little vintage flower embellishment comes in a 5 pack at Hobby lobby. Painting on glass is easy! Using the chalky paint, you simply give the bottles two nice coats, and then lightly wax and sand if you prefer the distressed look. Dress them up anyway you choose. 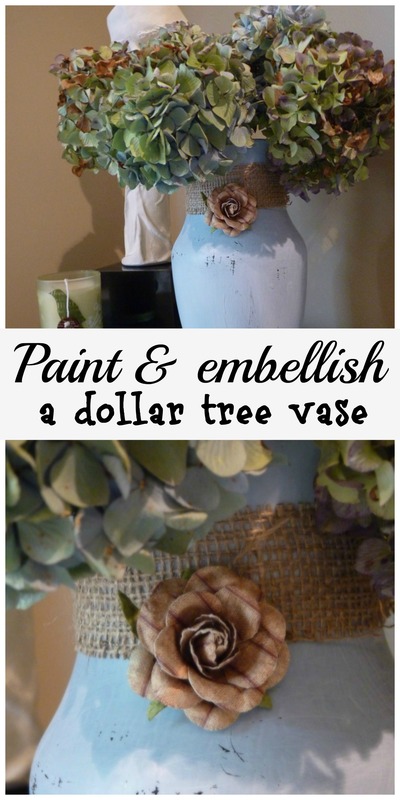 If you like this painted dollar tree craft you will loved these beautiful bottles I recently did. I used a steel pad to sand the bottle. I enjoy waking up, turning around and having this little lovely arrangement greet me. Hi Debbie Dear! Oh, your little painted vase looks wonderful and the hydrangeas are so pretty. This looks good in your bedroom. So sweet and homey. 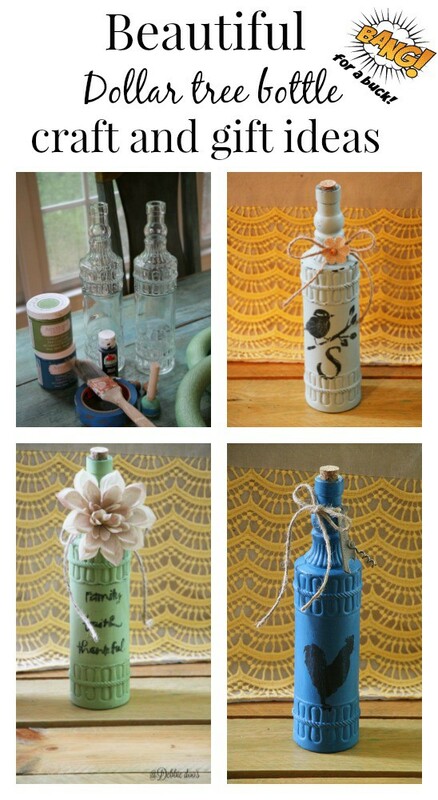 HI Debbie, Thanks for sharing your DYI for these very pretty bottles! A perfect vase for your very pretty hydrangeas! I missed out on drying my hydrangeas – they are way past their prime now! Love your cute little bottle! Beautiful vase, Debbie. I love the gorgeous hydrangeas too! Painted bottles seem to be the “in” thing right now … guess I had better try it. Yours looks so pretty. How charming, Debbie! Love the burlap and the floral embellishment…and the hydrangea is gorgeous! Debbie, this is so cute! Hydrangeas are my faves! Beautiful! I loved it when I saw the sneak peek and I love it now! I really need to paint some glass! And the dried hydrangeas? My fave! I had some, but my cat really liked them. The hydrangeas really didn’t like the cat back. What a mess! LOL! Great job, Debbie! Cute vase and very pretty hydrangeas. She has tons of bushes. Very pretty look! I love hydrangeas too. Just yesterday, I “harvested” the last of my hydrangeas…the ones that escaped being cut, earlier this summer. I have 7 or 8 bushes and am going to plant a couple more next month. I can’t get enough of this flower! See you tomorrow at the “home Tour”! What a great project, and I like your vignette on your nightstand! 😀 Free projects are the best, aren’t they! Great job, Debbie! The vase turned out great! I love hydrangeas. I just wish I could grow them! I knew your bottle would be gorgeous, Debbie. 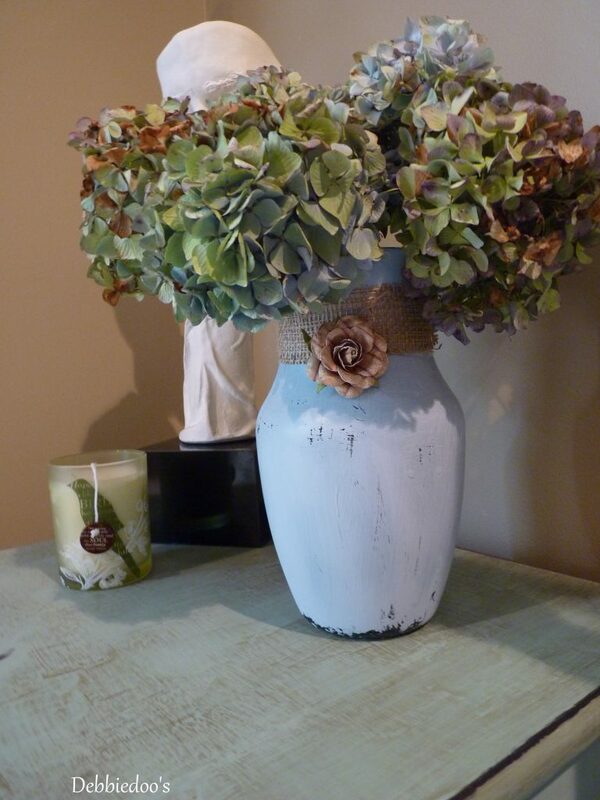 I love the faux flower with the burlap, and the hydrangeas. Great combo. I love the color of the bottle Debbie…Beautiful hydrangeas…I am sure they make you smile first thing in the morning! Very pretty Debbie! That last shot of your room is beautiful! Debbie, I think it looks fantastic. I’m another one who just loves dried hydrangeas. The fresh ones are my favorite fresh “bush” flower, and the dried are my favorite dried flower. I love the vase and your dried hydrangeas. That was sweet of her to give you those beauties! It looks just lovely, Debbie, & the hydrangeas are the perfect flower for the sweet vase.